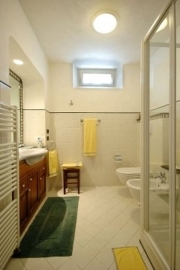 The B&B Ernestina is situated in the centre of the town of Miane with garden and private car parking. It’s an ideal place for a relaxing holiday with the possibility to visit the most romantic city in the world Venice and the Dolomites with the beautiful Cortina. There are ample parking facilities, gardens, a large living room with fireplace for the exclusive use of our guests, tastefully decorated bedrooms with private bathrooms, independent entrance and two bedrooms with air conditioning. If you prefer we have a fully equipped apartment suitable for three people. Breakfast is abundant with the typical local products. To learn more about the history of our region several pamphlets, books and videocassette are available. We can arrange visits to local wineries for tasting and, for those who love nature, we can organize walks or excursion on mountain-bike. If you wish to stay in Venice for more than one day, an apartment close to the famous S.Marco Square can be made available, provided adequate booking time is given. Our guests are entitled to a discount at the beauty centre located in the medieval castle (Castelbrando), 5 minutes from the B&B.